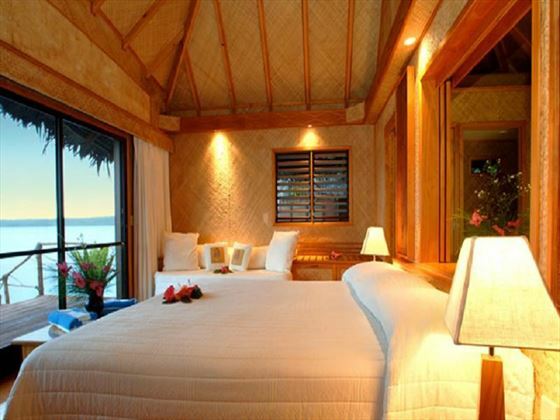 Wake up every morning to a shimmering horizon of turquoise lagoon and the gentle sound of waves lapping against pure white sand – it doesn’t get much better than Aitutaki Lagoon Resort & Spa; your exotic Pacific Island dream brought to life. Days here are made for lazing. The deserted powdery beaches offer the perfect spot for sunbathing or chilling out in a hammock with a good book. This is an adult-only paradise free from stress and enjoying the mellow soundtrack of the Pacific Ocean. 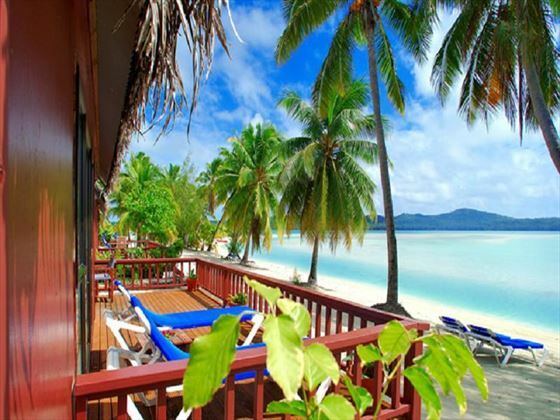 You’ll find the only overwater rooms in Aitutaki here as well as a stunning range of beachfront bungalows, so there is accommodation to suit everyone. The romantic atmosphere lends itself to couple and honeymooners – there’s an elegant and grown-up feel to the place. Sample the fresh seafood at Bounty restaurant and enjoy scintillating view over one of the most beautiful lagoons in the world. 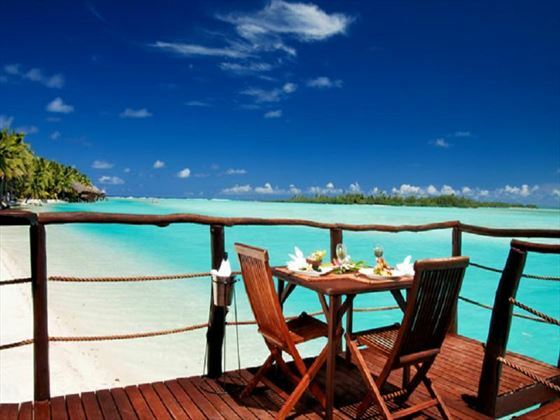 Directly looking over the gorgeous turquoise hues of the Aitutaki lagoon, the resort sits on the private Akitua Island in the Aitutaki atoll. Set on the fine white sands with sublime views of the crystalline, azure waters of the sea and lagoon, these beautiful 60sqm bungalows are equipped with a comfortable selection of amenities, accommodating up to three adults. 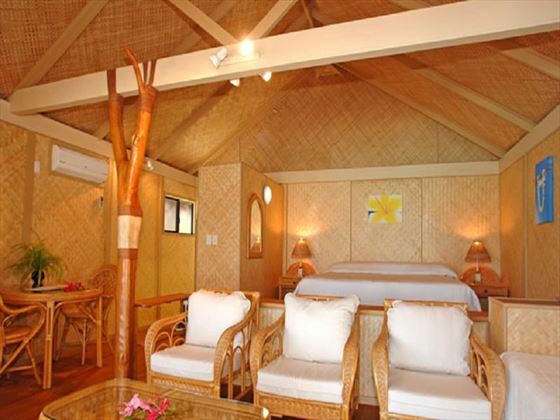 Directly located on the champagne sands of sunset beach with magnificent views across the full expanse of Aitutaki Lagoon, these 60sqm bungalows are nestled under the cool shade of coconut palms, featuring upgraded amenities and plush, sumptuous furnishings. Accommodates up to three guests. Nestled upon the pristine white sand shores of Sunset Beach with an utterly breath-taking view of the magnificent Aitutaki Lagoon, these tranquil hideaways are set beneath the emerald coconut palms. A perfect choice for romance and serenity, couples will enjoy a heightened level of private living space, world-class vistas and a luxurious selection of amenities, alongside plush décor and comfortable furnishings. Accommodates up to three guests. 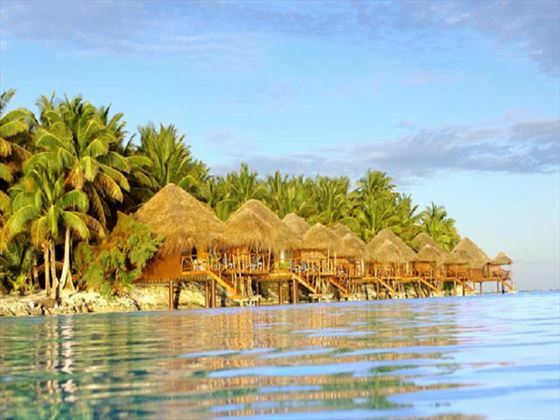 The Cook Island’s only overwater bungalows, you’ll experience some of the planet’s most sublime views over the azure Aitutaki Lagoon. Appointed with exotic, stylish décor, these gorgeous 67sqm abodes are complete with a thatched roof, pandanus-lined walls and direct access to the warm, tropical waters below. Accommodates up to three adults. A stunning, totally secluded retreat ideal for honeymooners, these extravagant 105sqm villas boast unforgettable vistas of the world’s most beautiful lagoon. Fully enclosed in its own luscious private garden, this romantic sanctuary showcases polished island hardwoods and black pearl-shell transformed into gorgeous hand-crafted furniture pieces. Designed for luxurious island living, you’ll be just two minutes by private ferry from the main island to your own exclusive island paradise. Accommodates up to four adults. Set on the sublime beach, this laid-back bar and grill serves delectable international cuisine and a fabulous selection of refreshing drinks to match with breath-taking vistas of a seemingly endless, shimmering lagoon. Offering an elegant menu of fresh seafood and other delicious treats, Bounty boasts views across the Full Moon Channel, and is located close by to the swimming pool and lobby. This is the ideal spot to enjoy a tropical buffet breakfast or fun themed dinner evening. An incredibly romantic dining experience on the beach, this private experience is all yours to delight in as you sink your toes into the soft sand or gaze into the star-studded sky over the shimmering lagoon in the flickering candlelight with a bottle of chilled wine. If you’re in the mood to enjoy a comfortable breakfast in bed or a romantic dinner out on your private, gorgeous terrace, the resort features a wonderful in-room dining and beverage menu to make use of all throughout the day.